I consider Mr. Chandraprema’s book “Gotas War” which was launched last week to be the finest and most comprehensive description and analysis of the fratricidal ethnic conflict which affected Sri Lanka for over six decades. It is also a detailed analysis of the military operations that successfully terminated the armed uprising of the terrorist organization known as the LTTE. Very soon we will be celebrating the third anniversary of that victory. The Author Chandraprema recreates comprehensively for us the battles which began in Mavil Aru in the East and ended at the Nandikadal lagoon in the North with the deaths of nearly all the top leadership of the LTTE. I must begin with the title of the book “Gotas War”. When you read the book you learn that it does not mean that Gota won the war single handedly. In fact it describes how it was a joint effort from the President of Sri Lanka down to the most recently recruited foot soldier. Each one played his part. The book points out that it was a very happy and rare coincidence that the country’s chief executive and the chief executive of the defence forces were so close that there could be no misunderstandings or conflicts in the execution of the military offensive. Such combinations are rare. Military history has many examples of offensives being derailed by political decisions. In this book there is a chapter on the Vadamarachchi operation in which Gotabhaya played a significant and brave role as a front line commander, which was stopped on its tracks much against the wishes of the armed forces, and even the Defence Minister Lalith Athulathmudali, on orders from the President J R Jayewardene who was pressurised by India to stop the offensive. Many external pressures were exerted on President Mahinda Rajapaksa too. For instance the then Foreign Ministers of France & UK flew down to meet him; but he did not give way. Today our President remains, while the blundering foreign ministers have been thrown out by their voters. In this book the author has interwoven the biography of Gota with the broader picture of ethnic relations – first in the field of parliamentary politics and then in the military confrontation. In both areas there are many lessons to be learnt. History is a very demanding teacher and we cannot afford to repeat past mistakes. As Karl Marx said “History repeats itself first as tragedy and then as farce”. When I discussed this book with Mr. Chandraprema, he tactfully suggested that I should concentrate on the early chapters dealing with political processes. Perhaps he quite rightly realized that my reading of the military aspects may, at best, be considered amateurish even though because of my brother who is a Major General, I got to know many of the senior military commanders mentioned in the book. But one element has always amazed me – I frankly think we should have given much more publicity to the heroic rescue operations undertaken by our security forces particularly at Pudumathalan. Our forces were able to cross the lagoon, take the opposite bank, go past the mangroves, reach the bund and allow the people forcibly held by the LTTE to cross over to freedom. I would like to refer to p. 460 of the book. “By first light, the people on the other side were able to stampede their way over the bund and for a few hours the LTTE lost control. Over 33,000 people escaped from 6.00 a.m. up to around 10.00 a.m. While many human rights activities are worried about what happened in Nandikadal lagoon they do not refer to the armed forces sacrifices to bring out innocent Tamil civilians across the Pudumathalan lagoon. If they wanted to attack civilins as alleged by these NGOs would soldiers have even given their lives in sniper infested Pudumathalan to bring out the refugees. Let us hope that this book will restore the correct perspective. I now turn to the earlier chapters of the book which deals with the growing escalation of conflict in the constitutional arena. The most distinctive aspect of this are the attempts on both sides to find a constitutional solution in spite of the periodic outbursts of violence which, except in the 1983 episode, were not directed by the state. A distinction must be made between mob violence on both sides and the state sponsored pogrom which was launched by the J.R. Jayewardena regime through Cyril Mathew and his followers. Mob violence unfortunately has become a part of the post-independence scenario in Asia. The ethnic violence of post partition India and Pakistan, the July incidents of Malaysia between the Malays and Chinese, the massive violence in New Delhi following the assassination of Indira Gandhi and the successive mob violence in Sri Lanka both in the South and North, as pointed out by the author, have been a part of the birth pangs of ‘new nations’ of Asia. Professor S.J. Tambiah a professor at Harvard University and my teacher at Peradeniya University, has written about the sociological factors involved in such mob violence in his book “Leveling Crowds”. In it he clearly points out structural elements that lend to ethnic based mob violence. In all these cases a significant fact is the perceived injustice by a stronger community. While that majority community may be stronger in terms of brute strength, they feel that they have been cheated or let down by a partner with whom they have lived together, and even depended on for economic progress. Leaving Sri Lanka aside Tambiah found similar structural phenomena in the Hindu outburst against Sikhs in New Delhi following the killing of Indira Gandhi. Another tragic finding is that in all these cases the victims are poor, innocent people of a minority community who happened to be in the way. The “innocent bystanders” of whatever ethnic community are victimized because of their race. Chandraprema highlights the rhetoric which the ITAK (Ilankai Thamil Arasu Kachchi, better known as the Federal Party) indulged in the North and the East and the inflammatory results of media coverage for such statements. For example the grandstanding by the ITAK inhibited Prime Minister S W R D Bandaranaike from proceeding with the Tamil Language Special provisions Act which was to be coupled with the Sinhala or Official Language Act. This coupling, which was referred to by journalists as “Sinhala Only but Tamil Also” could not be completed because of communal conflict which frightened Bandaranaike. While Chandraprema rightly faults the ITAK for its false rhetoric I feel he has tended to downplay the communalism which was deliberately promoted by the anti-Bandaranaike faction in the SLFP to embarrass the Prime Minister. I have personally informed Chandraprema of some of some of the facts I unearthed during my research into this period. As this book clearly indicates Mr. Bandaranaike was unable to control events in the face of growing communal hysteria. He was a liberal in his thinking on communal matters. But this extremist group, strengthened by the exit of Philip Gunawardene and his radical faction, steadily eroded his base, humiliated him and finally assassinated him. The violence of 1983 is a different matter. This was encouraged by the government which felt that a “surgical strike” by Cyril Mathew’s goons would warn off the Tamils of Colombo who were not unaware of what the “boys” were doing in the North. Their sympathies were clearly with the terrorists. The overkill by General “Bull” Weeratunga who was sent by the President as described in this book, to root out terrorism also exacerbated Tamil sentiments in Colombo. As clearly described in this book the country is paying a heavy price for the government sponsored ethnic violence of 1983. We read of the comments made by the PLOTE, TELO, EPRLF and LTTE leaders who welcomed with open arms the battered returnees to the North in ships chartered by the Govt. As a result terrorist recruitment increased, a diaspora was created, foreign countries were drawn in, India changed attitudes, Tamil Nadu was filled with refugees and the Sinhalese were stigmatized. This was the sorry pass in 1983 and soon after. Though many of the Tamil grievances like language use, education and recruitment were addressed the ‘game’ had changed completely. It is only after the defeat of the LTTE that the space has now opened up for a process of reconciliation and dialogue. I like to end this presentation by referring to the main protagonist of the book – Gotabhaya Rajapaksa. Clearly he encompassed within himself many “wining” characteristics which changed the tide of the war. Firstly, he had the absolute confidence of the President. It was this ready access and mutual affection that helped to fashion an efficient fighting machine. Few realize that thousands of decisions have to be made in a war on a regular basis. Financing and procuring of weapons, coordination, building up of morale and setting priorities all demand absolute confidence. As this book shows there were many setbacks in theatres of war. Sometimes mistakes were made. For example in this book we are told of Denzil Kobbakaduwa’s reluctance to immediately attack Jaffna which gave time to the LTTE to regroup and repulse an army attack on Jaffna. But mutual confidence is the best morale booster. Secondly, Gotabhaya was a soldiers’ soldier. He knew the army from his days as an officer cadet to the highest commanding levels. He could understand the feelings of the foot soldier. Thirdly, he built up a team of battle hardened commanders. The earlier armchair Generals were eased out and front line commanders were given their place. He probably remembered Napoleon’s dictum “I want only lucky Generals”. Fourthly, he had a clear objective. Once the war was launched President Mahinda Rajapaksa did not flinch from this objective. No amount of pressure, even from visiting foreign ministers, could make him change his mind. Finally, I refer to Gotabhaya’s superb administrative and technical skills. He is technology savvy and his administration is exemplary, as we now see in the development of the cities of Colombo and Kotte. So I see this book as a very comprehensive work and a fitting tribute to a war hero who was destined to come back to his people and his mother land, end terrorism and give his country the space to emerge as a developed nation. We salute him and wish him well. I am sure that your former professor, Thambiah if he reads this would want to distance himself from your glib nepotism. This man Chnadraprema is just a lacky of the Rajapakshas and as expected tries to make a story of GO-RA the we all known deserter who ran away from the war front worked in a 7Eleven as a store assistant. This was was won with the strategies adopted by Gen Fonseka and he was the driving force of the war victory. Amunugama talks about the mob violence and it was started by Cyril Mathew of Kelaniya and his goons from JSS the notorious UNP trade union in which Sarath A was a member too. I dont understand why it took 35 years for Sarath A to come out of UNP violence which was fuelling the Tamil arms struggle and a cannon feeder for extremism. Winning so decisively – what many experts had dubbed an unwinnable-war – against the well-oiled machine of the LTTE stands-out as the single biggest military achievement by any nation so far in the 21st Century. Without the brilliant performance of the military leadership team the victory is quite unlikely to have happened. President Mahinda Rajapaksa, Defense Secretary Gothabaya Rajapaksa, General Sarath Fonseka, Admiral Vassantha Karannagoda, Air Chief Marshall Roshan Gonnatilake and everyone in the Sri Lankan armed forces are to be congratulated for winning the un-winnable war. However, given the greatness of the war victory we must not lose sight that the greater victory – of winning the real peace – has eluded us now for three years. While Sinhalese leaders have proven, without a doubt, their abilities in the battle field they are yet to demonstrate the statesmanship capacities essential for evolving visionary solutions towards a just society for all citizens. And the only way to approach the broader challenge is the same way we did with the war – with un-daunting commitment, courage and urgency of purpose. As did president Rajapaksa courageously stood up to the pressures exerted by the Western powers during the latter stages of the war, he must now muster the courage to stand up to Sinhalese Buddhist extremist forces in the greater interest of building a just nation. I look forward to the future release, “Mahinda’s Peace”. “Today our President remains, while the blundering foreign ministers have been thrown out by their voters.” This was the similar way Sadam Husain of Iral and Col Gadafy sopoke in the past every one knows what happened to these Tyrants. Dias, look out for “mahinda’s mistake”, which is releasing Sarath..Also where is the part of Gota running to US?!?! In this book, is there any mention of deliberate targeting of the people, the hospitals and torture, rapes, and unlawful executions of surrendered prisoners, etc? If you do not know, any thing of that sort happened, please read, what the former BBC reporter Frances Harrison said about the final faces of war in her speech at the London front line book club on May 16th 2012. Why don’t you ask your honourable president to allow a proper investigation to take place about the war? We do not have even a proper account of the death at present!!! After reading this your article, we know what this book is all about. Uh…It took 30 years for an army to defeat an enemy it outnumbered 50 to 1. That too, an army recognized internationally as a legitimate actor and therefore supported by numerous countries including India and supplied with sophisticated weaponry and a far superior airforce against an organization that had to smuggle weapons and work in the shadows due to it being considered illegitimate. Consider for a second if the roles were reversed — what do you think the outcome would have been? So much for “their abilities on the battlefield”. 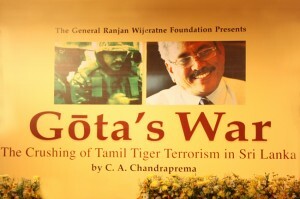 “When you read the book “Gota’s War” you learn that it does not means Gota won the war single-handedly” – So why did Mr. Chandraprema title the book with Gota’s name? So very likely he would have named the book after “Gen. Fonseka” if HE was in charge of the political establishment today? What is the position of this Man with so much greatness in releasing Gen. Sarath Fonseka? Will the General be quiet? I feel can do send some serious message even by appearing in public but not say any word. May be white van? The battle was won decisively by the SL forces, end of the story! What Dias and many of us are wishing for; lasting peace in our island, where every one who was born in the island can be proud of being Sri-Lankan, irrespective of their ethnicity. Gotcha or need Gota to explain? Just kidding. Have a nice day pal! Was the author of ‘Gota’s War’, Chandraprema a key figure of the PRAA, under the political patronage of Ranjan Wijerantne, which was instrumental in the killings of JVP members during 1987-1989 period? Selective amnesia. Where were YOU during that time? (As the Jaffna Public Library burnt to ashes by Cyril Mathew’s goons) Didn’t you white wash all those atrocities as the Sec of Ministry of State? You really don’t have to kiss Rajapakse brothers’ asses in your last days of this planet. Have some shame — then again how can one expect such from folks like you. The biggest joke is quoting Karl Marx. What the f— do you know about Marx! WHO READ THE BOOK BEFORE MAKING COMMENTS AS SUCH. So far I a not in the position to get GOTA’S WAR book. Only today I was told it contained 500 pages. Yet I don’t know what the price,and place of availability.My Myperplexity is how those who make speedy comments in this regard. IS THIS BOOK AVAILABLE THROUGH INTERNET? or WERE THEY ACTIVATING ON THEIR PERSONAL AGENDA? if the roles were reversed — what do you think the outcome would have been? Probably the same. Nothing but Widows,orphans, weeping mothers and broken men. Irrespective if all these ‘what ifs’, the outcome of the war would allways be death, destruction and misery. Sadly, you wouldn’t see many smiling faces in a war. Where did those so called Sinhalaese proven abilities go when Rajiv Gandhi brought down his IPKF on Sri Lankan soil? Please do remember when time comes this kind of books will talk against Rajapaksas. That day Sonia and India will not be there to help. Do check website when West and Europe accuse war crimes on some one, what happens to the accused. Plenty of examples you would find…. Gota’s war may be inspiration for some today…..West is capable of using it against Rajapaksas in future. Which part of South Asia do you come from? You must be from either India or Burma. Are you related to Kerala Naga People? If you are from the North which tribe do you belong to? Dr. Sarath Amunugama had consistently distanced himself from all the atrocities unleashed against the Tamil population by the GoSL before, during and after the war by maintaining a deafening silence on all those happenings. But he is as guilty as the rest of the war criminals by virtue of associating with them and by lending his tacit support to all the terrible punishments inflicted on the Tamil civilians in the name of fighting terrorism. Only now he has started talking about these matters and that too because somebody asked him speak about the book. He is another person who should be sent to The Hague. So the three meter high Bund was broken on the wee hours of April 20, and 115,000 captives poured into Army held territory. Some Western diplomats invited by the President watched on TV ,the first 33,000 who were escaping and how they were shot at and blasted to stop them . Did these Western Diplomats asked Mr Callum Mcrae,to have a look at this footage, when he was making his CH4 Genocide Documentary?. Or was Mr Callum McRae reluctant to show the Diasporians who did the shooting and the blasting?. Or was he afraid that his 40,000 death figure would have been reduced by at least 33,000 who were seen by th Western diplomats escaping through the hole in the Bund,punched by the brave soldiers?. When will the real truth come out ? what were the roles played by other countries during the war when will Dr Amunugama stops repeating the SL Government words that the Tamil People were liberated then why are they still in camps ? I am sure some wise guy will say they don’t want to get back to their houses because they they are lazy etc . The truth how can they start their lives when they don’t have a basic farming tools like a mammoty’s to dig the land? These guys are living in their own dreams reality when it strikes the question would be what happened ? So all the problems were caused during UNP’s time by UNP or through UNP inaction? The single most turning point in the war against tigers was the defection of Karuna for which UNP takes credit. Someone might soon write Ranil’s war or Karu’s war. is this book written in English or in Sinhalese? It is written in ENGLISH.So far I don’t know wether the sinhala translation is available. The price of the book is Rs,1000.00. Contained 500 pages.It is available in local book shops. It a must to need to some time to read and study the book. Not even a passing reference about the role played by Sarath F.
Was it similar to your own deafening silence? What is the political solution that we should bring quickly? Runs are on the Board. CMC Mayor, the supposed to be the savior and the” resurrecter” of the UNP can’t do anything without Gota’s help. What does the Opposition offer to counteract the formidable development Gota bros have put in place ,especially in the last three years.? Ranil Wicks looks pathetic on TV, with his dirt digging. Latest is his accusation that Gota is digging” Nidanas.” And the Govt is digging the CXE and the EPF. Ownership of Appolo, 20% commissions and Summer Winter palaces probably gone past the use by date. And his Whiz kid who is supposed to bring home the bacon for us peasants when they roll Rajapaksas ,can’t even comprehend the growth rate in the North. Perhaps Messers Sambandan and Sumanathiran can inject some value for money ideas and challenges to make the Ranil Faction a worthy Opposition. It will be fantastic if they can direct their energy away from pleasing the Diaspora and towards building the Ranil faction so that Mr Wicks can deliver some credible blows to the Govt, instead of insulting the intelligence of their backers, who are supposed to be the non peasant class. Then the Ranil backers can get at least a a little bang for the buck. And may be Sambandan and Sumanthiran can even become part of the shadow cabinet and ditch their communal political tag. This is wirtten in Rajapakish… only bootlickers and scum of the earth can read it..
Not for normal educated people. Just read the book, Todate the best one on the war, even better that Narayan Swamy ! I read a lot of books, but I must confess that am not even tempted to read it for I can predict the contents in general and it would be a waste of time. I wonder whether Gota himself took a bit of time out to read it?? Hah..hah.. hah… “A US based gasoline pump operator’s war” would be an ideal topic! The above mentioned statement of Dr.Sarath Amunugama,mentions destiny.He may be right,because when gotcha left the army and went to the USA and was doing ordinary jobs there,little would he have realised that what the future holds for him one day in Srilanka. Gotcha’s birthday was a few days ago on on 20th June and he was born in 1949.I had a look at the life path number of this enigmatic personality and it was very interesting. If you add 20+6+1949=1975.If we add 1+9+7+5=22.Then add 2+2=4. 2.Practical,trusworthy and down to earth individual. 3.idealistic nature grounded in practical terms,allowing to conceive grandiose schemes and carry them through to the end. 4.A builder of society.If you are a part of this cream of the life path number 4,can become a master builder in society. 5.If you desire and are willing to work for it,can achieve enormous success,prestige and fame. 6.Ability to take orders and carry them out with dedication and perseverance. 7.Demand as much from yourself as you demand from others,sometimes a lot more from yourself. 8.Have the kind of willpower that is often mistaken for sheer stubbornness. 9.Honest beliefs and ever direct speech makes a No4 come across as completely unremitting( unceasing,constant). 10.Once a decision is made,it will be followed through to the conclusion,whether it was right or wrong decision. 11.Very set in your ways and determined to handle things in the way you are certain that they should be handled. 12.tenacity of purpose and ability to get the job done,borders on obsession. 14.An excellent organiser and planner because of the innate ability to view things in a practical and commonsense manner.Planning is necessary to avoid errors and it is the rare life path 4 who does not have a to-do list by his/her side at all times.Your life is programmed in a orderly fashion,permitting you to catalogue and manage the ideas and activities that fill your day. 15.Strong desire to be a perfectionist. 16.Loyal and devoted to your spouse,you make the best of your marriage. 17.friends are few,but you are close to them.Once friendships are formed,they often last a lifetime. 18.One of the most dependable people,but misses the big picture and major opportunities that come once in a way,due to bad tendency to being caught up in the daily routine of affairs. 19.dogmatic (asserting opinions in an arrogant manner)to an excess. 20.shallow type of people turn you off and you lack the tact to keep your feelings from being totally clear to everyone. Only those who know will be able to say whether the characteristics of a life path number 4,matches with gotcha you by my white van. By the way bill gates is also a no 4,born on the 28th october 1955.If you add 28+10+1955=1993.If you add 1+9+9+3=22.This number 22 is called the master number.If you add 2+2=4,which is the life path number.So bill gates is a master no 22 and life path number 4,a 22/4. Gotcha is also a 22/4 because If you add 20+6+1949=1975.If we add 1+9+7+5=22.Then add 2+2=4. Master numbers of 11 and 22 will have potential for a shot at greatness,than those without them. President is lucky to have a brother like Gota. « Devolution and the concept of concurrency: Abolition or reform?